More detail is located on the this post, so please click on this link. The Canadians had crossed the Moro River against stiff opposition on December 6, 1943 and captured Ortona on the 28th, after a week of bitter street fighting. The cemetery contains the graves of those who died during, before and after that period. 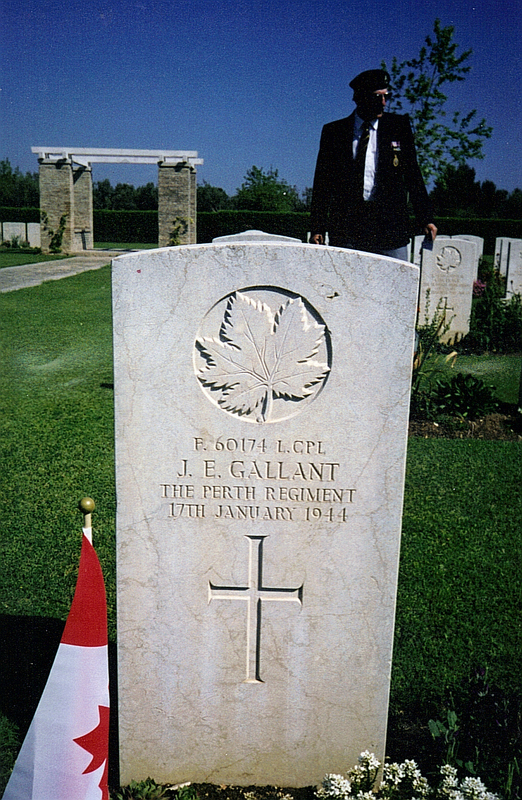 In December 1943 alone, the 1st Canadian Division suffered 500 fatalities. The sad description of this battle can be found here. I find it very upsetting to read about the futility and the conditions. Uncle Joe is commemorated on Page 311 of the Second World War Book of Remembrance. With the loss of her husband, Joseph, Mary Millicent (Millie) Poirier Perry Gallant married Louis Richardson Hogan. Millie and Lou lived in Halifax, Nova Scotia and were friends with James Perry’s Uncle Gussie and Aunt Beatrice, his mother’s brother. The image of Millie and Lou, below, is cropped out of the family photograph on St. Paul’s Church steps after Mamie’s funeral in 1964. I read Joe’s military file the other evening. There were a few documents that I wanted to save to Joe’s story. First, his Attestation Papers…especially as it relates to Joseph’s appearance. At only 5’9″ and 134 lbs, I reflect on the humanity of the soldiers who were called up to service. Joe is listed as a Laborer, but in recent research, I discovered one of my ancestors who was a Florist, prior to going to war. These men came from all walks of life. Next, I wanted to save, to my archives my Great Uncle’s documents at the time of his loss, first, listed as MIA and next, KIA. I wonder about the devastating news being delivered with such formality. We see such moments in various movies…and read about them in novels…but, imagine this moment in real time. Horrific! Both his mother and his wife would have received medals some time after this letter. I found several letters that Millicent wrote in her own hand to the powers-that-be, struggling to receive financial support that was coming to her…one letter was particularly poignant where she is asking for 76.00 before Christmas…one pleading for Joseph’s personal effects. I’m posting a list of these items. I think that they speak of what is important when we strip all other things away. May my Great Uncle rest in peace and may perpetual light shine upon him. I agree, Dad. That’s why I think our family research is so important. Can you imagine how scared those young men would have been? Very Nice Kathleen, my uncle Melvin was also at Ortona, Gussies brother.